The name “Baobab” is derived from Arabic which means “father of many seeds”. 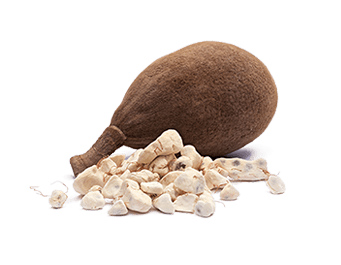 Baobab contains approximately 12% water, modest levels of carbohydrates, pectin, riboflavin, magnesium, potassium, iron and phytosterols, with low levels of protein and fats. Baobab contains 50% more calcium than spinach, is high in antioxidants and has three times more Vitamin C than an orange. Blends with other fruits such as pomegranate and acai.